In 2018, Indonesia's mergers and acquisitions (M&A) landscape is expected to accelerate, continuing the positive trends in 2017. An annual report entitled 'Transaction Trail', issued by Duff & Phelps in 2017, provides an insight into transaction and capital market activities – M&A, private equity, venture capital and initial public offerings – including those in Indonesia that year. The country has contributed significantly to the growth in deal-making, driven by inbound investments, representing 68 per cent of M&A deals in Indonesia, Singapore and Malaysia. According to the report, Indonesia recorded 81 M&A deals in the period from January to June 2017, with a total value of approximately US$4 billion, compared with 71 deals worth US$1.9 billion in the first half of 2016. Technology was the largest sector in value terms, representing 26 of the 81 deals. In terms of volume of deals, financial technology and the sectors associated with it has been the most active in the past 12 months, driven by new regulatory frameworks on peer-to-peer lending and payment systems. In terms of value, M&A in the manufacturing and energy sectors still lead in most transactions. Since being elected in 2014, President Joko Widodo has initiated various regulatory reform measures, packaged under a series of 'deregulation policies' (or economic deregulation packages (EDPs), aimed at combating regulatory complexities and bureaucratic hurdles. The first EDP was launched in September 2015, since when there have been revisions to support the objectives of EDP reforms. The government launched Government Regulation No. 91 of 2017 on the Acceleration of Business Implementation on 4 December 2017, which was followed by the head of the Capital Investment Coordinating Board (BKPM)2 issuing Regulation No. 13 of 2017 on Guidelines and Procedures for the Implementation of Capital Investment Licensing and Facilities (BKPM Regulation 13/2017). The Indonesian government aims to simplify investment licensing and investment facilities procedures with the issuance of this regulation. Among the key changes are the possibility of simplified licensing for services sector by allowing certain companies to apply a full licence directly and simplification of merger approval from a two-stage to a one-stage process. In general terms, the statutory framework for combining businesses through a limited liability company is set out in Law No. 40 of 2007 on the Limited Liability Company (the Company Law) and various implementing regulations, such as Government Regulation No. 27 of 1998 on Mergers, Consolidation and Acquisition of Limited Liability Companies. In addition to the aforementioned 'umbrella' laws and regulations, the practice and procedure for implementing particular transactions must comply with other specific laws and regulations relating to the status or nature of business of the target company and is regulated by specific bodies. For instance, banks, financial institutions and public listed companies are regulated by the Financial Service Authority (OJK). The OJK is a body established by virtue of the Financial Authority Law (Law 21/2011) merging the authority previously held by the Capital Market and Financial Institution Supervisory Board or Bapepam-LK (Bapepam) and the bank oversight authority of the Central Bank (BI) to supervise all activities in the financial services industries under one agency, with the exception of payment services that are still under BI. Further, companies with foreign share ownership are regulated by the BKPM and for tax purposes, all companies are subject to the relevant M&A regulations of the Directorate General of Tax and the OJK, which also regulate share custodian services and securities broker-dealers. In addition, for M&A in the insurance sector, companies are required to comply with the Insurance Law and its implementing regulations; for M&A in the broadcasting sector, companies are required to comply with the Broadcasting Law and its implementing regulations; and for M&A in the telecommunication sector, companies are required to comply with the Telecommunication Law and its implementing regulations, and other sector-specific regulations to govern the respective M&A in the industry. consent from any relevant industry regulator, depending on the nature of the target company's business. An M&A transaction involves different companies, which can potentially result in a conflict of interest among directors, commissioners, majority shareholders and affiliates. Thus, with regard to the acquisition of a public company, in order to provide legal certainty and protection for shareholders – particularly independent shareholders who have no conflict of interest in particular transactions – the OJK under Bapepam Rule No. IX.E.1 requires a public listed company conducting an M&A transaction must appoint an institution registered at the OJK to appraise the transaction. In the event that the OJK finds a conflict of interest, the transaction will require approval by the independent shareholders through a vote at a GMOS. Another related regulation is Bapepam Rule No. IX.E.2, last revised on 28 November 2011. Rule IX.E.2 provides that disclosure of material transactions with a value of between 20 per cent and 50 per cent of the public company's equity must be published within two business days of signing the transaction documents; if the value exceeds 50 per cent, approval from the GMOS is also necessary. The rule also requires the results of material business transactions and changes in core business to be reported to Bapepam within two working days of completion. In the banking sector, banks are subject to Government Regulation No. 28 of 1999 regarding Merger, Consolidation and Acquisition of Banks. Indonesia has acknowledged the single-ownership principle of the Indonesian banking industry known as the Single Presence Policy pursuant to BI Regulation No. 14/24/PBI/2012 on Single Presence Policy. Pursuant to this policy, albeit only certain requirements and exceptions, a controlling shareholder of an Indonesian bank is allowed to be the controlling shareholder of only one bank. Another important regulation of bank ownership is BI Regulation No. 14/8/PBI/2012 on Share Ownership of Commercial Bank. The rule sets out maximum share ownership over Indonesian banks, around 20 to 40 per cent, differentiated based on the specific nature of the shareholders (whether the shareholder is also a bank, a financial institution or an individual). The rule allows ownership that exceeds this limit, subject to OJK approval. Further, there is a specific requirement for prospective foreign investors to commit to the country's economic growth, obtain approval from the authority of the respective country of origin, and be subject to certain ratings set out by the BI. Recently there have been regulatory discussions within the OJK to issue a new regulation on holding companies for financial conglomeration activities, which requires companies operating across different financial sectors to form a holding company that is also subject to OJK supervision. Financial industry stakeholders are waiting for the introduction of this new regulation. In general, developments in corporate and takeover laws aim to make the process more transparent, taking into consideration concerns of different stakeholders such as creditors, employees, minority shareholders and consumers, and within the framework of environmental protection and fair competition. The government is concerned about maintaining fair competition among business players in Indonesia. Consequently, regulations governing fair trade practices are frequently issued or amended. In connection therewith, the Business Competition Supervisory Commission (KPPU) recently issued implementing regulations to the Antimonopoly Law, namely KPPU Rule No. 10 of 2010, Rule No. 11 of 2010 and Rule No. 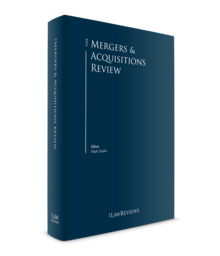 13 of 2010, which govern the consultation and post-notification requirements for mergers, consolidations and acquisitions, along with guidelines that, inter alia, provide for scrutiny of contemplated M&A transactions. These rules were issued as the implementing regulations of Government Regulation No. 57 of 2010 (GR 57/2010) on the Merger or Consolidation and Acquisition of Enterprise Share which may Result in Monopolistic Practices and Unfair Business Competition, which was recently issued by the government (see Section IX). With respect to acquisitions of public companies (also known as takeovers), Bapepam-LK regulations are still applicable, namely Rule IX.H.1 regarding Takeover of a Public Company, which was issued on 31 May 2011, amending the previous rule enacted in June 2008. This regulation introduces the concept of mandatory tender offer (MTO), which is triggered by a takeover of a public company. The rule requires the refloating obligation of shares obtained as a result of an MTO by 20 per cent. However, the OJK can grant an extension of the time period for a refloat of shares to the stock exchange in certain cases. The OJK also introduced OJK Regulation No. 54/POJK.04/2015 on Voluntary Tender Offer, which can be a tool for acquisitions for public companies with no controlling or simple-majority shareholders, amending the previous Bapepam-LK Rule IX.F.1 of 2011. In December 2016, the OJK introduced a revision to the regulation concerning merger and consolidation of public companies by virtue of OJK Regulation No. 74/OJK.04/2016. This regulation provides new documentary requirements for OJK approval in the event of a merger or consolidation of public companies. The required documents include corporate shareholding and management documents, an appraisal report, a business plan, notes on the new controller, and a management analysis report. The aim of this Regulation is to further promote investor protection and disclosure of information. Foreign direct investment in Indonesia is regulated by Law No. 25 of 2007 on Capital Investment (the Investment Law) and its implementing regulations issued by the BKPM. As the appointed regulator of direct capital investment in Indonesia, the BKPM has mainly focused on the efforts by the government to attract foreign investors and to build an international economic environment. The most recent rules on foreign equity restrictions are stipulated in Presidential Regulation No. 44 of 2016, which determines which business sectors are open or closed for foreign investors and, if open, to what extent foreign direct investment is permitted (the Negative List). The Negative List is the first and most important regulation that any foreign investor contemplating investment in Indonesia should consult. If the business of the companies in the contemplated M&A is in a field of business that is closed to foreign investment as provided in the Negative List, then the foreign investor cannot invest in that business field in Indonesia. However, if the business is one of the listed business fields that are conditionally open for investment, then foreign investment in that business is permitted but the contemplated M&A involving foreign investors will be limited regarding the level of foreign ownership of shares allowed in the Negative List. As a consequence of the involvement of foreign investors in an M&A transaction, the Indonesian company will be required to convert its status from a domestic company into a foreign investment company within the framework of the Investment Law. plantation: maximum foreign ownership is 95 per cent. Most private foreign direct capital investments in Indonesia are administered and supervised by the BKPM. Consequently, most matters relevant to M&A transactions must be reported to and will require approval of the BKPM chairman. BKPM Regulation 13/2017 sets out the procedures for obtaining BKPM approval for new investments, changes in shareholders, mergers or business expansions. Public companies, on the other hand, are regulated by the OJK. Unlike private companies, unless specifically provided under a separate regulation, public listed companies have no restriction on foreign ownership of shares provided the investment involves foreign passive portfolio investors and not strategic or controlling foreign investors. Moreover, the provisions under the Negative List are not applicable to a public company whose shares are acquired by foreign investors in portfolio transactions made through the domestic capital market. For years, Indonesia has been substantially relying on the energy and mining sector, being a strong force in the oil and gas business and the world's largest exporter of thermal coal. More recently, the rise of the middle class means increased consumer spending, and therefore consumer sectors such as retail, consumer technology, consumer goods, transportation (including aviation) and property are the main targets. The biggest deals in 2017 were made in the digital economy and technology sector. This was a stark shift from 2016, in which the mining sector led most of the deals following the acquisition of Newmont Nusa Tenggara by Medco Energy. In general, based on the latest studies conducted by various companies, such as Bain & Company or Solidiance, the number of M&As in Indonesia's technology sector has been rising during the past couple of years. For example in 2017, China's e-commerce giant Alibaba Group Holdings injected US$1.1 billion into Indonesian e-commerce platform Tokopedia. The Indonesian ride-hailing start-up Go-Jek benefited from a US$1.2 billion injection, led by Chinese internet giant Tencent Holdings Ltd in a move to maintain competition. GrabPay has been rebranded 'GrabPay, powered by OVO' following a partnership between GrabPay's in-app cashless features and Lippo Group's OVO, a licensed e-money provider, which somewhat overlaps with its rival Go-Jek announcing the acquisition of three of the largest fintech companies in Indonesia. Outside the e-commerce industry, another big deal involved the tobacco industry. Japan-based cigarette manufacturing company Japan Tobacco Inc bought 100 per cent of the shares in Karyadibya Mahardika and Surya Mustika Nusantara, both of which are subsidiaries of Gudang Garam (Indonesia's second-largest tobacco manufacturer). As in other jurisdictions, the financing of M&A in Indonesia is generally derived from internal cash flow, bank loans (provided such financing is not intended for investment in speculation on shares), issuance of new shares (share swaps) and issuance of financial derivative instruments. Various regulations are applicable depending on the nature of the financing scheme, including the reporting requirement to BI for foreign currency denominated loans from offshore banks or entities, submission of registration statements to the OJK if the transaction involves conducting a rights issue and approval by the BKPM for an increase in equity to finance expansion (growth by acquisition instead of organic growth). The prevailing regulations that affect the financing of M&A are as follows: BI Regulation No.12/24/PBI/2010, regarding Offshore Debt Reporting Obligation; BI Regulation No.12/10/PBI/2010 regarding Offshore Borrowing of a Non-Bank Corporation, BI Regulation No.10/28/PBI/2008 regarding the Purchase of Foreign Currency Against Rupiah through Banks, and BI Regulation No.14/16/PBI/2012 regarding Short-Term Financing Facility for Commercial Banks which, inter alia, prescribes reporting and credit rating requirements in some cases. BI also issued Regulation No. 7/1/PBI/2005 regarding Offshore Borrowing of Banks, which has been further amended by BI Regulation No.13/7/PBI/2011, BI Regulation No.15/6/PBI/2013 and BI Regulation No.16/7/2014, containing, among other things, an obligation for banks to limit the daily balance of short-term offshore borrowing to a maximum of 30 per cent of capital. Another key regulation on the matter is BI Regulation No.16/21/PBI/2014 on Implementation of Prudential Principles for the Management of Foreign Loans of Non-Bank Corporations to make improvements to BI Regulation No.16/20/PBI/2014, which previously regulated the same. This Regulation aims to prevent foreign loans and excessive foreign debt from hampering macroeconomy stability, by providing guidelines for non-bank corporations to implement prudent principles in managing their loans with foreign parties. In managing foreign loans, companies must implement prudential principles by complying with the prescribed hedging and liquidity ratios, and credit ratings. Hedging and liquidity ratios are based on foreign-currency assets (receivables) and liabilities (obligations) from forwards, swaps or options transactions. Mandatory use of rupiah as the transaction currency is another hot regulatory topic in Indonesia. On 28 June 2011, the government issued Law No. 7 of 2011 on Currency (Mata Uang). Article 21(1) of Law No. 7/2011 provides that the rupiah shall be used in every payment transaction, fulfilment of other monetary obligations, or other financial transactions within Indonesian territory, with certain exceptions. In 2015, BI issued BI Regulation No.17/3/PBI/2015 on the Mandatory Use of Rupiah within the Republic of Indonesia. The regulation basically strengthens the Currency Law, and provides clearer guidance that the Law applies to both cash and non-cash transactions. The Regulation also explains in details the five exceptions to the rule. Law No. 13 of 2003 on Employment (the Labour Law) provides the framework for rights of employees and employers in the M&A context. Basically, since M&A is only related to the change in ownership or control of a company, it should not in any way affect employee status. In general, there are two possibilities with respect to an employee's continuance in the company with new controlling shareholders (in an acquisition) or with the surviving company (in a merger), which could be either the extension or renewal of the employee's term of employment. In the case of renewal of employment, the employee will have his or her contract terminated from the previous company (before it was merged or acquired) and then be rehired by the surviving company under new terms and conditions. Accordingly, there is a requirement under the Company Law for boards of directors of companies undergoing M&A transactions to publish a summary of the proposed M&A in at least one newspaper and announce it in writing to the employees of the surviving or acquired company no later than 30 days before the invitation of shareholders to the GMOS. Should an employee not wish to maintain his or her employment with the surviving company, then he or she has the right to refuse the new employment. Thus, the employee can resign from the company and demand a special severance payment, long-service payment package and accrued compensation (such as untaken annual leave or housing allowance, if applicable) as set out in the Labour Law, Article 163(1). It should be noted that the Labour Law does not specify the percentage of ownership that triggers the entitlements but simply refers to a 'change of ownership'. There is a risk that the employees or their union (if any) will take the position that any change of ownership will qualify under Article 163(1), even where there is less than a 50 per cent change in shareholding. Any substantial change in management and employment policies, however, could also trigger Article 163(1), even though the new shareholder is not a controlling shareholder, as this may directly or indirectly affect the employees. However, under Article 163(2) of the Labour Law, employers (both the buyer and the seller) also have the right to terminate employment in the event of a change in a company's status, a merger or a consolidation, subject to the payment of severance and long-service payment as set out in Article 163(2), which is set at a higher level than under Article 163(1) mentioned above. In addition to the above, the rights of employees in M&A transactions are also governed by the provisions relating to M&A transactions in a collective labour agreement entered into by and between the company and the company's labour union. In the event of inconsistency between the provisions of the Labour Law and the collective labour agreement, the provisions that are more favourable to the employees will prevail. As in other jurisdictions, the accounting method used in mergers is generally a 'pooling of interest' method and a book value transfer approach. Article 1(3) of Minister of Finance Decree No. 43/PMK.03/2008 of 13 March 2008 on the Use of Book Value for Transfer of Assets in Relation to Merger, Consolidation or Spin-off (MOF Decree 43/2008) defines a 'business merger' as a merger of two or more taxpayer entities with capital divided into shares in a manner that maintains the existence of one of the companies having no residual loss or having a smaller residual loss. fulfilment of requirements of the 'business purpose test' (described below). In addition, Article 3 of MOF Decree 43/2008 provides that a taxpayer conducting a merger using book value may not compensate the loss or residual loss of the merged taxpayer. In general, one could conclude that there will be no capital gains tax (corporate income tax) if the Directorate General of Taxation has issued the approval for a merger with book value. In the event that the transfer of assets using book value is not approved by the Directorate General of Taxation, then the transfer of assets shall be valued at the market price and the difference between the book value and the market value (capital gains) will be subject to corporate income tax at the rate of 25 per cent (flat rate). The transfer of assets is subject to VAT at 10 per cent of the market value, pursuant to Articles 4(1) and 7(1) of Law No. 42 of 2009 on Value Added Tax and Sales Tax on Luxury Goods (the VAT Law). The VAT should be imposed by a 'taxable business entity' on the delivery of assets, the initial purpose of which is not to be traded, except assets on which the VAT cannot be credited because the acquisition of such assets has no direct relation to the business activity, and for acquisition and maintenance of sedan or station wagon motor vehicles when made for a trading inventory or for rental purposes. Government Regulation No. 41 of 2016 provides that the disposal of land and buildings is subject to final income tax at the rate of 2.5 per cent of the transfer amount that is stated in the deed, which is a reduction from the previous 5 per cent rate (the transferor's tax obligation). Moreover, the transfer of land or buildings in a merger is subject to land or building title acquisition duty (BPHTB) of 5 per cent of the taxable value (NJOP) (the surviving entity's tax obligation). The acquisition value of the tax object (NPOP) in the merger is the market value or the same as the NJOP. The taxpayer who carries out the merger and obtains approval for the use of book value for the merger from the Director General of Taxation may apply for a 50 per cent reduction in the BPHTB. Article 17 of Law No. 36/2008 on Income Tax provides that the maximum tax rate for individual taxpayers is 30 per cent and the tax rate for corporate taxpayers is a flat rate of 25 per cent. Public companies that satisfy a minimum listing requirement of 40 per cent along with other conditions are entitled to a tax discount of 5 per cent off the standard rate, giving them an effective tax rate of 20 per cent. For transfer of shares in general, the difference between the acquisition of shares and the selling price of shares will be subject to capital gains tax at the rate of 30 per cent (maximum) if the seller is an individual and at the rate of 25 per cent (flat rate) if the seller is a corporate taxpayer in Indonesia. If the seller of the shares is a non-Indonesian taxpayer, then the capital gains tax from the selling of the shares will be regulated based on the applicable tax treaty between the seller's country of domicile and Indonesia. For a transfer of shares of a public listed company, a final tax of 0.1 per cent of the transaction value will be applicable to the seller and 0.5 per cent tax on the founder shares (if the seller is holding the shares from the initial public offering). Certain provisions of Law No. 5 of 1999 on the Ban on Monopolistic and Unfair Business Practices (the Antimonopoly Law) deal specifically with M&A. Essentially, pursuant to Article 28 of the Antimonopoly Law, M&A transactions are prohibited if they result in monopolistic or unfair trade practices. Therefore, all efforts should be made to ensure that any contemplated M&A transaction does not give rise to a monopolistic or unfair practice. The Antimonopoly Law uses a market share standard as a parameter for ascertaining the presumption of a monopoly (if a business player has more than a 50 per cent market share), for ascertaining the presumption of an oligopoly (if a group of business players has more than a 75 per cent market share) and for determining the dominant position (if a business player has more than a 50 per cent market share, and as a group, those business players have more than a 75 per cent market share unless the dominant position is not abused). the total turnover of the companies concerned is more than 5 trillion rupiah. It should be noted that subscription to newly issued shares (capital increase) shall also be deemed acquisition. The KPPU provides for a consultation procedure and post-notification within 30 days of completion of the contemplated deal. In addition, GR 57/2010 provides that a bank conducting an M&A transaction shall submit a post-notification of the transaction to the KPPU if the total value of assets of the bank concerned is more than 20 trillion rupiah. Any non-compliance with this requirement will be sanctioned with administrative penalties. whether an M&A transaction is necessary to prevent a company's bankruptcy. It should further be noted that pursuant to Article 47(2.E) of the Antimonopoly Law, the KPPU has the authority to cancel an M&A transaction if it has elements of monopolistic or unfair trade practices. Moreover, the Antimonopoly Law may apply to foreign entities that are not doing business in Indonesia but have entered into agreements with Indonesian entities that may result in monopolistic or unfair trade practices within Indonesia. Hence, it would be advisable for investors contemplating an M&A transaction to file for a consultation prior to completion of the contemplated transaction with the KPPU to avoid cancellation of the transaction at a later stage. There was a major and unprecedented shift of M&A deals dominated by the technology sector during 2017, in contrast to 2016 when the mining sector still dominated. Consistent political support by the new government has generated renewed optimism about Indonesia's potential growth, as there is substantial untapped potential for M&A, given Indonesia's consumer market, to cater for the needs of the rising middle class. Natural resources (coal, palm oil, natural gas, petroleum and mineral resources) remain an important sector, but telecommunications, retail, property, construction, technology and financial services have proven to be the sectors that have led the market. As a democratic country that has undergone significant reform in the last two decades, challenges still remain. Bureaucratic red tape and corruption have become the main obstacles to sustainable growth. However, several reform initiatives have been introduced to restore confidence in the business climate. Investors are still waiting for the effects of new procedures introduced by Government Regulation No. 91 of 2017 and the subsequent BKPM regulation at the end of 2017 to streamline business processes. Financial and securities regulations, as well as corporate governance rules, have been set up to provide a more sophisticated and modern regulatory environment for foreign investors. In light of the foregoing, it appears that recent economic development shows market confidence that the Indonesian government will continue to maintain and improve transparency, the certainty of stakeholders' involvement, fair competition and a more friendly environment for foreign investment. 1 Yozua Makes is the managing partner at Makes & Partners Law Firm. 2 BKPM is an investment service agency of the Indonesian government.